Incorporate into your daily nutrition. Call for pricing. Your skin is your body’s largest organ. For skin to look its best, it needs to be in optimal health—and it’s not just what you put on your skin that matters, but what you put in your body as well. A leader in innovative anti-aging medicine, Dr. Gregory Buford has long recognized the benefits of a holistic approach to skin health, and he is excited to offer Aethern® Advanced Skin Beauty Program to his patients in Denver. This great-tasting, drinkable collagen and antioxidant supplement can help you get noticeably younger-looking, more radiant skin in as little as 4 weeks of daily use. 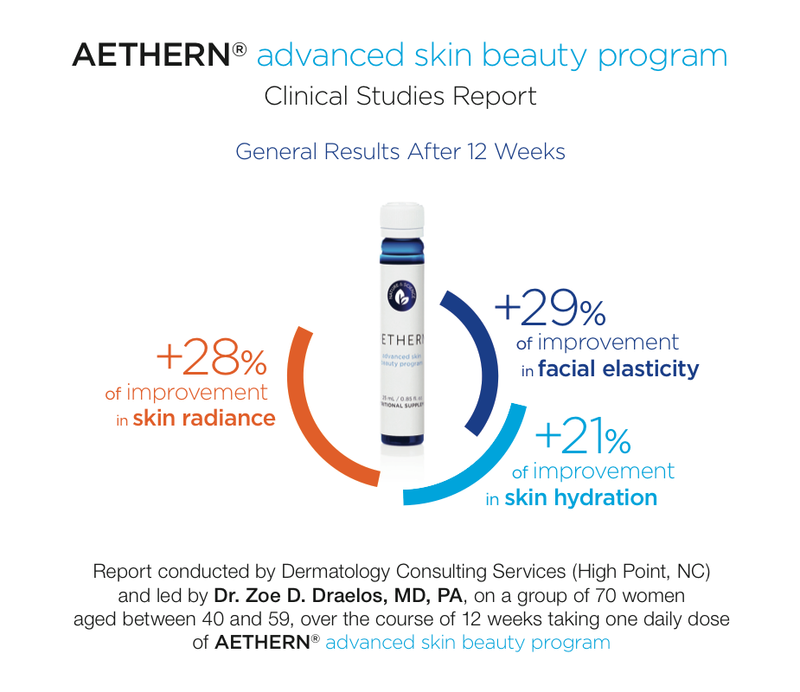 What is the Aethern® Advanced Skin Beauty Program? Aethern is a proprietary nutritional supplement program that is designed to improve skin health, firmness and radiance in as little as one month. The program is simple: drink one Aethern “liquid shot” each morning before or during your healthy breakfast, and continue a regular high-quality skin care regime as usual. Many supplements claim to “promote” more radiant skin, but Aethern has the science behind it. Founded by molecular gastronomist Abili Falcó i Buixeda and developed by top European nutrition scientists, Aethern is the product of years of meticulous research into the macro- and micronutrients that best benefit skin health, and is clinically tested to ensure its quality, efficacy and safety. How does a drinkable formula compare to topical treatments? You know that healthy nutrition is essential to look and feel your very best—you are what you eat, after all. However, in today’s fast-paced world, few of us have the time shop for and prepare meals on a regular basis, leading to shortcuts in our diets that don’t always provide the optimal balance of macro and micronutrients to keep us in prime health and fight the effects of skin aging. The truth is, not even the best physician-grade topical skincare can make up for a deficit in micronutrient intake. Moreover, over-the-counter multivitamins often lack the correct bioavailability in their ingredients—meaning that a good portion of that impressive list of vitamins and minerals ends up going straight through your body. Aethern is formulated with these issues in mind. proprietary blend of bovine collagen peptides, hyaluronic acid, Mediterranean polyphenols (antioxidants with anti-inflammatory properties) is carefully formulated for maximum bioavailability, so you can feel confident that what you’re drinking is being used by your body. What is in Aethern’s Skin Beauty formula? Aethern delivers essential nutrients for healthy, radiant skin without a bunch of extra sweeteners and flavorings that you don’t want or need. Each ~1 oz. shot contains 5 grams of protein and only 60 calories. Lightly sweetened with natural fruit syrup, Aethern has a light grape taste that most patients find very palatable. Best of all, Aethern contains just what your skin needs to fight the natural aging process, repair environmental damage, and help you maintain a youthful, radiant look.